London artist Ed Gray studied at Wimbledon Art College and Cardiff University of Wales graduating with a BA Hons degree in Fine Art in 1995. Aided by a grant from the Prince’s Trust Ed worked at various jobs in the city to fund his desire to continue painting from a squat in Elephant and Castle. In 1998 he trained to be a school teacher and taught art and design at a Peckham secondary school for four years while his work became commercially successful. In 2001 Ed was awarded a sabbatical from his career as an art teacher to complete a residency with the Masterworks Foundation of Bermuda. He became a Fellow to the Foundation and taught art in a prison facility on the island. Successful Bermudian exhibitions led to a painting trip from Panama to Mexico City where he recorded his impressions of daily life in nine Central America cities. Following these experiences in 2004 Ed decided to leave his formal teaching career to work as an artist, initially as a resident artist in a studio in a secondary school in Camberwell. In 2005 Ed completed a painting trip to New York and visit Edward Hopper’s studio. Primarily a painter of his birthplace London Ed is inspired by artists such as Hogarth, Lowry, Breughel, Archibald Motley, Jock McFadyen and the Tintin cartoons of Herge that he loved as a boy. Ed returned to Mexico with his wife Ingrid in 2008 to live and create work about Mexico City. Inspired by this trip Ed returned to New York to set up a studio and then travelled to Bangkok and Tokyo in 2009 to depict life in these cities. Subsequently in 2009 Ed was chosen to represent England for the official Fine Art Collection for the 2010 World Cup in South Africa. He travelled to Cape Town and worked with artists in Langa Township where he drew inspiration for his paintings from football matches in Gugulethu Township. His depiction of a township football match featured in a global touring exhibition and in the New York Times. Ed curated and exhibited at the London Mayor’s ‘London and Londoners’ exhibition in City Hall for Munira Mirza in 2010 and was artist-in-residence at the Gherkin 30 St Mary Axe in 2012. Following his ‘London Souls’ exhibition at St Pancras Crypt Gallery,a large retrospective of his work took place at the OXO Gallery London in 2014. ‘Londonessence: Adoration’ contained new works about the city inspired by his love of Adoration paintings from the Sainsbury Wing of the National Gallery. In 2016 Ed curated ‘A London Entertainment’, a visual and aural celebration of the spirit of London for his exhibition at Rich Mix Arts Centre featuring a gospel choir, a Pearly king and Queen, a David Bowie tribute act, Viv the Spiv and music and film inspired by Ed’s paintings that was created and performed by students from London Centre for Contemporary Media. Ed produced new works inspired by the National Gallery for his St-Martin- in-the-Fields in his exhibition ‘The Passing Show’ in 2018 and gave a series of public talks there about his paintings and his adoration of London as an endless source of inspiration.. 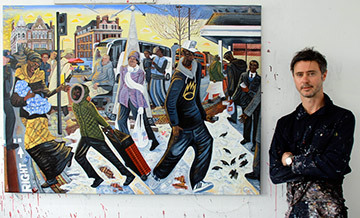 In recent years Ed has given public and corporate workshops, talks and lectures about his paintings of London and the concept of the city as a source of artistic inspiration. He has worked for the University of Connecticut London’s ‘Widening participation Programme’ and lectured about Hogarth for the Sir John Soane’s Museum London and Queen Mary’s University London ‘Art in the City’ MA module. Ed regularly delivers contextual and practical workshops on urban art and figurative painting and sculpture and has been visiting artist in primary schools, secondary schools, colleges and public institutions such as the Royal Drawing School, Tate and Dulwich Picture Gallery. ‘One Year’ a documentary film about Ed’s paintings was acquired by the Tate Britain Archive in 2012. Ed was awarded his greatest honour in 2014 when he was made a Listed Londoner by BBC Radio London’s Robert Elms Show in 2014.